I had a routine midwife appointment on Wednesday and he has confirmed that baby Squish is now fully engaged - something I had guessed from all the groin pain I have been having and the lack of any kicks in the rib area. Everything is going well though and I had to have bloods taken this week too as I am hoping to give birth in the midwife led unit and I need to prove my iron levels are high enough and that I am healthy and fighting fit. I am getting quite a few pains low down now and have found that baths before bed really help to relax my body. Somehow I have made it to 36 weeks without needing any extra toilet trips and I am very thankful as falling asleep at night isn't as easy as it once was - at least I can stay asleep until the little guy wakes me up! Tiredness is certainly kicking in during the daytimes and although I haven't been taking many naps yet, the TV is playing a much bigger role in childcare as I don't always have the energy to do the same puzzle for the 76th time. I am still working though and can get through an 8 hour shift on my feet no problems - it is amazing how a toddler can tire you out! Bump has definitely dropped now that the little guy has discovered his escape route and It looks like he may fall out at any moment! Not too many new stretchmarks though however I have outgrown several of my maternity tops now. Dresses seem to be the way forward if I don't want to flash too much skin and they are also the most comfortable thing to wear. Bump is still measuring larger than average but not as big as with Dylan so I am intending to pack newborn still for the hospital bag, even if I have to squish the little one into it! I am still nowhere near organised, but I have a gorgeous new Pink Lining bag ready to pack baby's bits into and we have everything ordered ready for Squish's room - just need to unpack all the boxes that are clogging it up first! 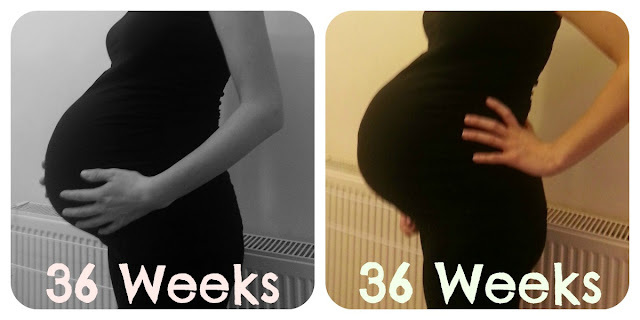 Next update will be at 38 weeks - the point where Dylan was born so I am hoping I make it that far! That is the scary bit! Thanks! I do seem to grow beach balls rather than babies! nooo, I seem to be the only one who thinks he will be late and that may be more due to wishful thinking . . .
My body does seem to redistribute any extra fat to the tummy region! Won't be long for you either though!